For a look that's pretty in pink without being the least bit prissy, don't miss this Pink Topaz and Pave Diamond Halo Ring in 14K White Gold! This attention-grabbing ring seamlessly combines a timelessly glamorous design with a gem that's anything but shy, accenting this stone with 0.39 carats of colorless dazzle in the form of 60 diamonds. The modern gemstone that stars in this halo ring perfectly captures the essence of girlhood dreams and fairy tale fantasies, and interprets it in a way that's completely grown up and glamorous. This 8mm cushion-cut topaz has a striking hue that's girly yet daring, and that refuses to be ignored. 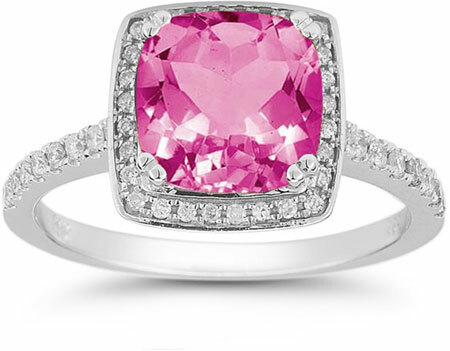 The rounded-off square shape of this gem gives it a sense of time-honored feminine appeal, balancing its bold hue. Under this outgoing pink topaz is an extra little touch that sets this piece apart: three diamond-studded petals of white gold. Additional diamonds surrounded the center gem with a halo of glimmer and adorn the slender band from which it rises, allowing this halo ring to reflect light in many directions. A backdrop of 14K white gold beautifully offsets all of these gems, allowing them to take the spotlight, and complementing them with cool shine. 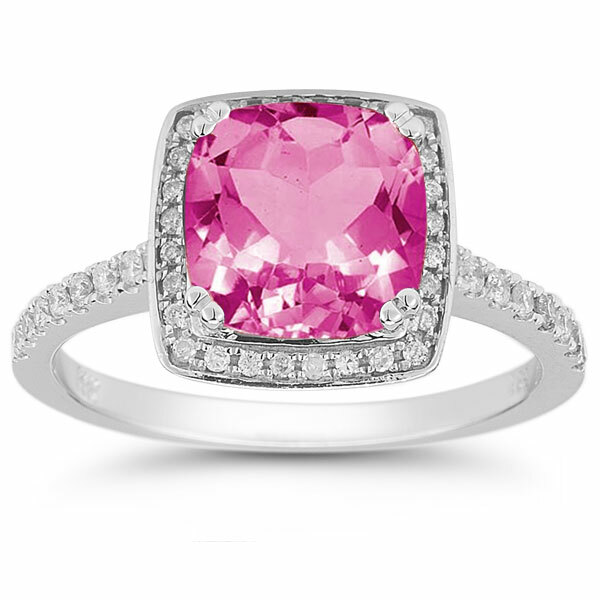 We guarantee our Pink Topaz and Pave Diamond Halo Ring in 14K White Gold to be high quality, authentic jewelry, as described above.